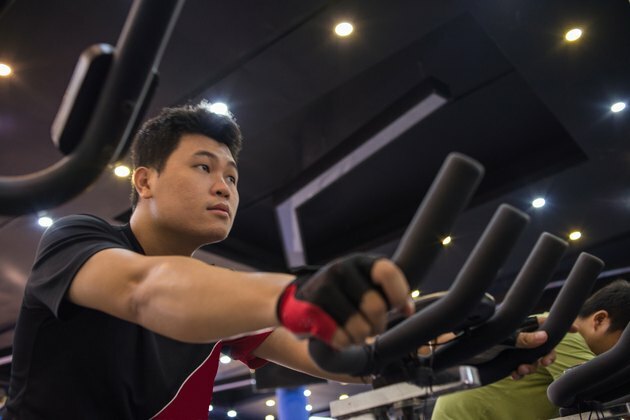 Exercise bikes offer a low-impact cardiovascular workout. They are available in an upright design, which mimics a standard road bike, and a recumbent design that offers a semi-reclined riding position and full back support. All exercise bikes offer varying levels of pedal tension. Two mechanisms that control the pedal tension are magnetic resistance and strap, or belt, resistance. The resistance mechanism on an exercise bike allows you to adjust the pedal tension, which makes your workout more or less challenging. Some bikes have manually adjustable pedal tension -- you turn a knob on the bike frame to change the pedal resistance. Other bikes have digitally adjustable pedal tension -- press a button on the console to change the pedal resistance. Although all resistance mechanisms serve the same function, some offer more advantages than others. Older exercise bikes are more likely than newer bikes to have a strap, or belt, resistance system. The strap system is a simple mechanism. A belt runs through two brakes. As you turn the tension knob one way, the brakes grab onto the belt, increasing the tension on the pedals. When you turn the tension knob the opposite way, the brakes move away from the belt, allowing the pedals to turn easier. Magnetic resistance is more technologically advanced than the strap resistance mechanism. To create magnetic resistance, two magnets set on each side of the flywheel. When you increase the pedal resistance, the magnets move closer to the flywheel, creating tension. When you decrease the pedal resistance, the magnets move farther from the flywheel, making it easier to pedal. A bike can have either manually adjustable magnetic resistance or digitally adjustable magnetic resistance. For manual resistance, a tension knob controls the magnets via cables. For digital resistance, an electronic signal controls the magnets. Magnetic resistance is typically quieter than strap resistance because the magnets never touch the flywheel; they just move closer or farther away. To create resistance on a strap mechanism, the brakes have to touch the strap, which creates noise. The most advanced form of pedal resistance is eddy current brake resistance, which uses the electronic signal, or current, to move the magnets. This type of resistance is usually only available on more expensive exercise bikes. What Resistance Is Best in an Elliptical?